If you suspect you have rheumatoid arthritis (RA) or have been recently diagnosed with RA, you will likely have lots of questions and be feeling uncertain about what this disease means for your future. What is the normal RA progression? Will my symptoms get worse? How can I manage the disease? Do I have to have a surgery? These (and more) are all frequent questions asked by RA sufferers. The reality though is that each patient will experience a unique progression of this disease. RA progression depends on multiple unpredictable variables. Because it is still unclear exactly what triggers RA, it can be nearly impossible to predict an exact outcome. Below is some general information about what to expect as well as the different stages of RA including the advanced condition known as progressive rheumatoid arthritis. In some cases, joint inflammation may continue or worsen despite treatment. It may not necessarily lead to a full progressive state of RA, but it may become more difficult to maintain your mobility and range of motion. There are four distinct stages of RA progression, and each has their own treatment courses. Stage 1: This is early stage RA. This stage involves the initial inflammation in the joint capsule and swelling of synovial tissue. The swelling causes the symptoms of joint pain, swelling, and stiffness. Stage 2: In the moderate stage of RA, the inflammation of the synovial tissue becomes severe enough that it creates cartilage damage. In this stage, symptoms of loss of mobility and decreased joint range of motion become more frequent. Stage 3: Once the disease has progressed to stage three, it is considered severe RA. Inflammation in the synovium is now destroying not only the cartilage of the joint but the bone as well. Potential symptoms of this stage include increased pain and swelling and a further decrease in mobility and even muscle strength. Physical deformities of the joint may start to develop as well. 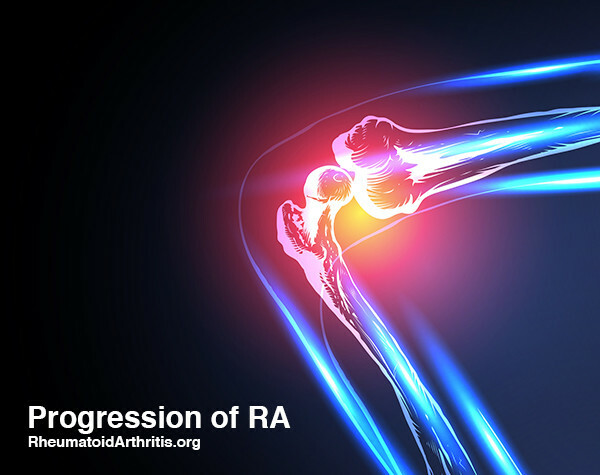 Stage 4: In the end stage of RA, the inflammatory process ceases and joints stop functioning altogether. Pain, swelling, stiffness and loss of mobility are still the primary symptoms in this stage. As with most diseases, early detection and diagnosis are crucial for being able to treat symptoms, manage pain, and slow progression. An early diagnosis of RA can help you and your team of physicians and specialists put together an individualized treatment plan so that you can continue living a high quality of life. Early on, you will want to discuss your case with a rheumatologist or RA specialist who can provide you with the treatment you need to delay the disease’s progression. Generally, early diagnosis treatment is aggressive and targeted to properly manage the disease and prevent it from progressing. If your RA was diagnosed in the early stage when symptoms first appeared, your chances of achieving longer periods of remission typically increase drastically. That’s not to say you won’t experience flare-ups. Early diagnosis simply helps manage the disease and cannot guarantee the complete elimination of symptoms. Progressive rheumatoid arthritis is the condition that occurs when advancing through the disease stages. This advancing condition is characterized by more frequent bouts of inflammation and worsening chronic pain. Additional symptoms that never occurred before can also start to develop in patients who have progressive rheumatoid arthritis. Progressive rheumatoid arthritis requires a deliberate treatment plan provided by a team of physicians and specialists. This plan should be tailored specifically to your individual symptoms and history of the disease. Keep in mind that what works for some patients may not work for you. Your response to treatment is largely dependent on the potential factors that triggered your RA, including genetic background. If you suspect that your rheumatoid arthritis has become progressive, consult your rheumatologist to determine the changes in your condition and discuss potential adjustments to your treatment plan. While it is difficult to prevent the disease itself due to its unknown causes, RA progression can be managed. The ultimate goal is to stop symptoms from worsening and to prevent the disease from advancing through its stages. If you undergo individualized, targeted and aggressive treatment early in your disease process, you are more likely to delay and possibly prevent the progression of RA. Working closely with your physician to determine the specific stage of your condition will help to create a unique treatment plan for you for each stage.